Under the shade of a cooling tree, a soft breeze and the soothing cup of green tea. 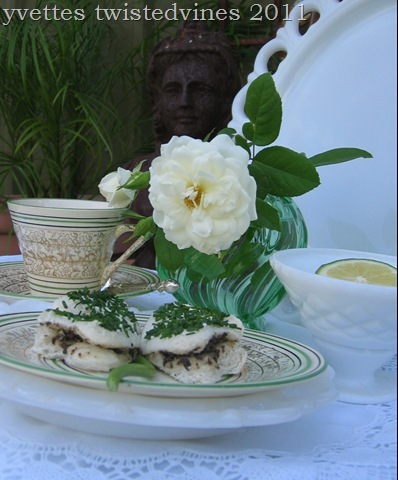 An afternoon tea with a touch of green. 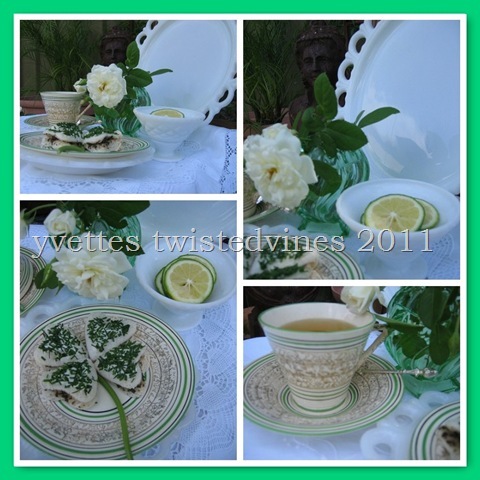 An afternoon tea with a touch of green to celebrate Saint Patrick’s Day. Could this be the lucky four leaf clover…dainty afternoon sandwiches. 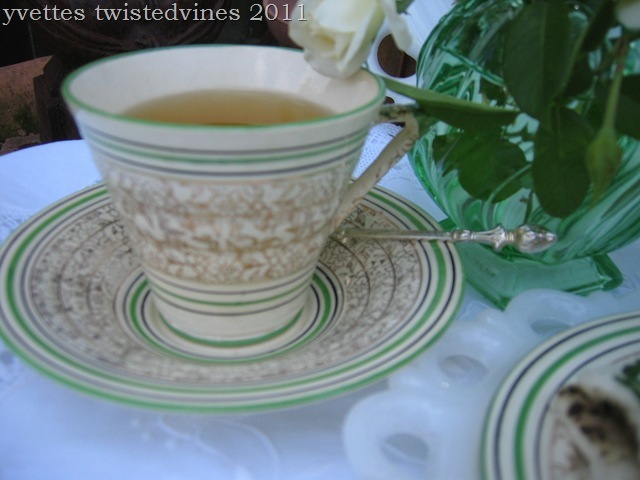 Green tea was served, this tea cup is a single three piece set I bought at auction. 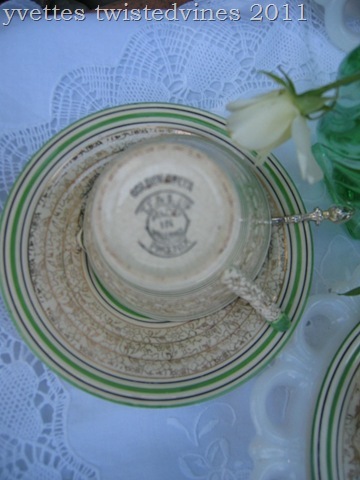 I loved the art deco style handle of this Thomas Forester & Sons Ltd. teacup. ‘Golden Delta’. Surrounded also by Hobnail Milk Glass. Wishing everyone a lucky St. Patrick’s Day. Next week with the start of Spring in the Northern hemisphere, I look forward to sharing the Spring fever, and capturing those warming expressions of Spring. 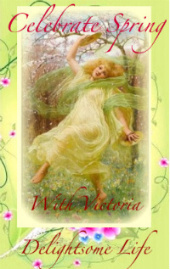 Inspirations from other particpants of ‘Celebrate Spring with Victoria’ details can be found here so join in , posting anything that inspires you to the loveliness of Spring. What a wonderful afternoon tea. I love your tea seat and I do enjoy the Irish Blessing. The colour of your photos are very soothing. Very nicely styled, I agree with Mandy, soothing colours. 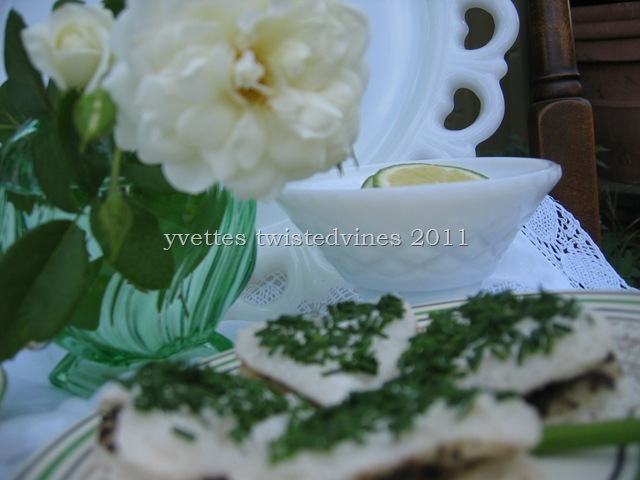 Yvette~ I love your “green” tea 🙂 Your milk glass platter in the background, with your rose leaf reflection is lovely & your sweet four-leaf clover tea sandwiches look delish! Wishing you a Happy St. Paddy’s Day! Your tea is very pretty with all your green and white! 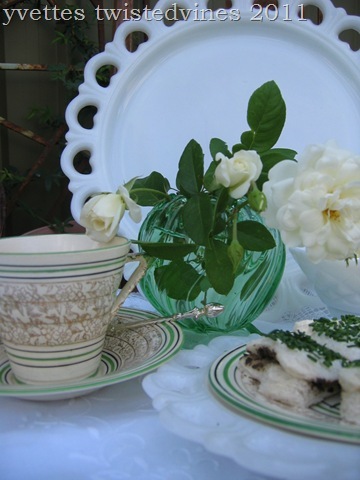 Love the white roses and hobnail glass. Thank you for joining me for tea and a very Happy St. Patricks Day to you. What a fun find. Your tea today is lovely. I hope you have a wonderful St. Patrick’s day! 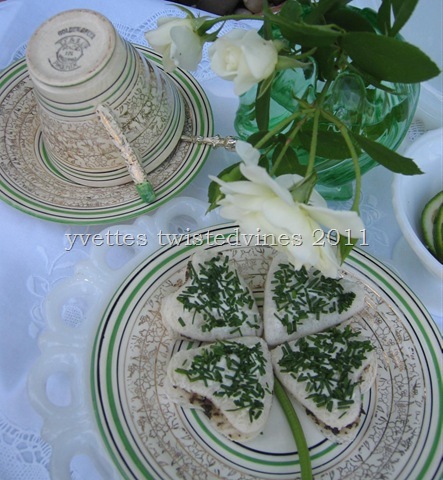 Thanks for visiting my blog and I love all the green and white in your post. It is calming yet informative too. Happy St Patrick’s Day! Lovely post. Your styling is beautiful. What lovely photos, Yvette. 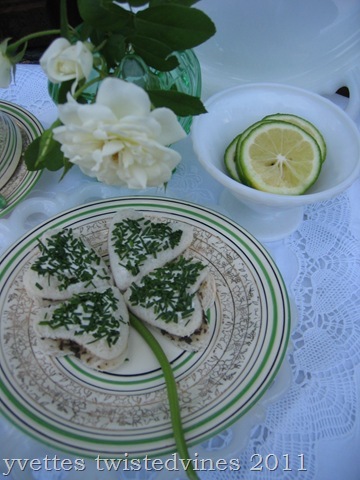 You shamrock sandwiches are darling, perfect for teatime. The green and white together is very pretty. I love your Irish Blessing – like a sweet, holy covering. St. Patrick was an amazing fellow, and it’s sure that we should celebrate him. Love your mosaic and all the photos. Beautiful. Yummy looking cookies too. Love how you made the cookies into a four leaf clover. Blessings. I simply love your design and your table scape. I would definitely hire you for a party. Wonderful post. 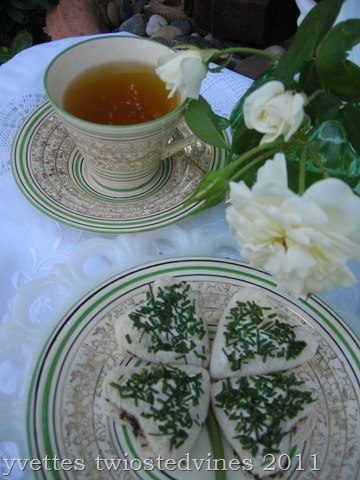 I especially love your creative choice of tea sandwiches; what a clever and pretty way of presenting them as shamrock sandwiches, in the manner that you did! The overall ‘teascape’ vignette is exquisite! Thanks for joining Pam and I for TTTT and also for my 74th, ‘Tuesday Tea For Two’. Just a brief note but packed full of appreciation, for your post that you shared with us this week. So creative with you vignette and the photograhy is great. I am eager to see you and what you design next week. I just love every detail of your post! The cups are exquisite – the shamrock sandwiches are adorable and I wish I had one now – and thank you for sharing about St. Patrick’s divine use of the clover. Just lovely! What a lovely table setting Yvette, Happy St Paddy’s day to u ! What a dreamy table. 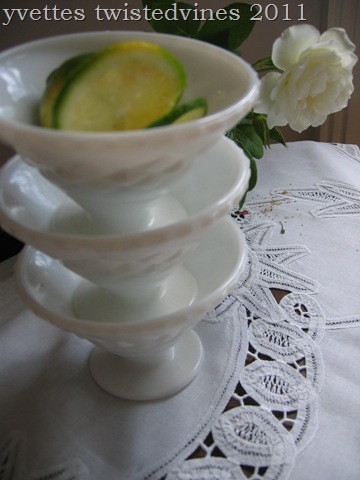 I want to come to one of your gatherings…I would feel like the Queen herself with your beautiful dishes and to.die.for green glass vase(LOVE IT!). The cookies are adorable as well. Thanks for sharing.